Due to my addiction to skin care products and love of discovering new things I started using Organic Cold Pressed Rose Hip Oil a few weeks ago to see what it was all about. Apparently, it comes from a specific type of rose and has tons of benefits like being an anti-aging treatment, helping to diminish the appearance of fine lines and wrinkles, with making scars disappear. etc. It promises to do what my best friend retinol already does. This specific oil was fun to use in the sense that it wasn't too thick or thin. It didn't promise to do anything in terms of helping reduce acne, which isn't a problem that I suffer from, but it is supposed to be helpful in reducing the appearance of acne scars. Those I do get because I love to pick at every little bump on my skin! 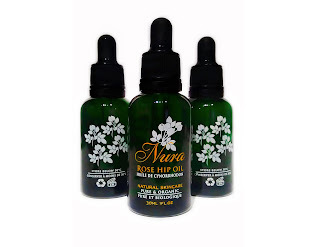 At the time hat I was using this oil I was going through something that prevented me from sleeping or eating and it was doing a number on my skin. I was amazed at how much that stuff affected it! While this rose hip oil did make my skin look a bit less dull during that time I can't say that it was really for any reason aside from it being an oil that was applied to my dry skin. I'm also that one person that everyone hates because my skin is genetically amazing and aside from getting a pimple once every few months the only thing I really suffer from is dryness (when I don't take care of it) and a sallow look because I have super yellow undertones.